Many people use their grill just for grilling hamburgers, chicken or a steak. With indirect grilling you can expand your grilling and even think about smoking your meat. The word indirect gives it away already. You are not grilling on top of you burning charcoal but will keep your meat on an other spot on the grill grate where there is no heat underneath it. Easier said, you put your charcoal on one side of the grill and your meat on the other side. 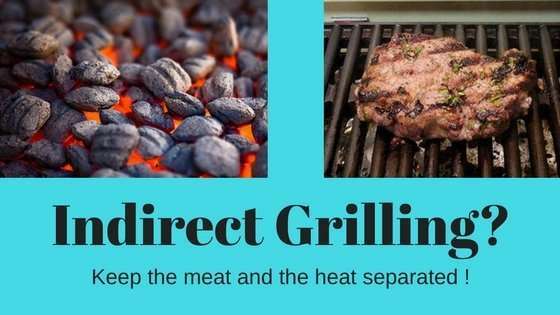 I am no saying that you should always set your grill up for indirect heat, but it has some great advantages over using charcoal all over the grill. When you cook more than one kind of meat like for example hamburger, hotdogs and chicken at the same time they need different cooking time. A hotdog is done pretty fast and a hamburger takes a little longer. Chicken might not need to much heat at all to cook. It will also give you the option to use wood chips for adding smoke flavor to your meat. Here is where indirect cooking comes in handy. You can move your meat from a hot to a cooler spot to cook it slower. This is the method I use most for my smoking since I do not have a separate fire box on my grill. I have a nice barrel grill that I bought years ago. The picture on the left is how it looks although this is not mine. Where the chicken is I usually have my charcoal. 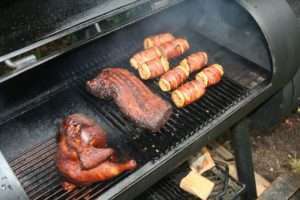 When I got interested in smoking on a low temperature I didn’t feel like investing in a smoker, and one of the pellet smokers we reviewed was also to expensive, so I just used my charcoal barrel grill in this way. I use the spot on the right side of my grill for the charcoal. I even take the grill grate there of to make it easier to access during smoking to add more charcoal if needed, just like in the picture. My meat I keep on the left side of the grill so it is not on top of the charcoal but away from the heat source. In this way I can keep my temperature as high or low as I want it. Higher is adding more charcoal and open the air vents. Lower is using less charcoal and keep the air vents more closed. It took me a while to figure out how much charcoal I put in one of my charcoal starters to start with. I used to much and the grill got way to hot for smoking on a low temperature. I needed a long time before it was cooled of and on the temperature I like to smoke. (225 Fahrenheit). After this initial learning curve I am pretty good at guessing how much I need for the pounds of meat I am smoking that day. One other thing I had to figure out was how to keep my charcoal grill at 225 degrees with my vents. After mastering that part my indirect cooking improved and I needed less time to set up my 2-zone grill system.